President Obama is more analytical than his predecessor, Defense Secretary Robert Gates said Sunday. 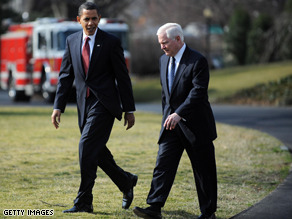 (CNN) - President Obama is more analytical than his predecessor, Defense Secretary Robert Gates said Sunday. Gates, the only Cabinet holdover from the Bush administration, initially paused when asked what the difference is between working with President Obama and President Bush. "President Obama is somewhat more analytical, and he makes sure he hears from everybody in the room on an issue. And if they don't speak up, he calls on them," Gates said on NBC's Meet the Press. "President Bush was interested in hearing different points of view but didn't go out of his way to make sure everybody spoke if they hadn't spoken up before," he added. Gates also said with a chuckle that the difference between working for the two presidents sounded like the subject of a good book. I did not check; but it seems that 9.5 out of 10 thought that Sec. Gates's statement was the understatement of the century. Wow! I wonder how the Supreme Court that "selected" Bush and the so-called religious rights guys feel now? Does anyone know when Harvard will take back its MBA from Bush? Obama is an idiot the President does not lead through concensius the President simply leads. I TYPE IN ALL CAPS SO MY OPINION OBVIOUSLY MATTERS! Your headline SHOULD read, "Gates says Obama more 'intelligent' than Bush"
He is. I'm sure he is reading the game very well and don't need the average American to tell him so. After all he is Mr Originality. What Bush has left us all, is the need to take care of each other, a basic American belief. Do what is right for each other. God bless us all, and I pray for our new president. This only means that George did things his way....what's wrong with that? Thank God...again that he was our president during 9/11. Thank God!! Analytical is not always good. Case and point. Jimmy Carter. It doesn't sound like Obama is capable of making his own decisions if he has to gather a ton of opinions. You're right! Bush only needed Cheney's opinion to make HIS decision! Calling on everyone in the room does not make you "analytical". You have a very intelligent / interesting comment, and I agree wholeheartedly ! To Wanda. Are you some sort of mind reader?? It just crackes me up reading comments from idiots who think they know what others are thinking. Stupid woman!!! Bush did his best for America, whether he is less analytical or not than Obama. They should not be compared. We were all given one mouth and two ears for a purpose; we should be listening twice as much as we speak. It doesn't matter what opinion one had before the election, now that Barack Obama is president, he deserves the respect and the trust of the people. The only way that his administration will succeed is if we are behind him on his decisions, so we have to step back and think to ourselves once in a while, "How many times have I been in control of a country? ", "Maybe he's there for a reason". We elected him and now we need to back him up. Hot stock tip, Buy Koolaide stock, so many socialists love it!! @David, he clearly makes his own decisions but unlike W., Obama wants to know all aspects before he laws down his decision. @TCM, Bush had NO grasp on the war, which is why we're royally messed up domestically and internationally. Obama has to listen to everyone because he doesn't have a clue what he is doing. He reads a speech, thats it! From outside of the USA, we could'nt comprehend Mr. Bush was elected for a second term. Its even worse to read some citizen that do not support their new president for at least a few months, knowing the difficulty the US citizen have to go through, the reputation of the US at near zero, the atrocious legacy Mr Bush leaves the country with. But then again I am not a citizen, so good luck. For all of you who say he is stating the obvious–unfortunately there are many out there for whom "this is surprising news." They of course will now trash Gates, but that is there only strategy. The man is brilliant and understands the meaning of "learning from others" and making a decision based on information not his "gut feeling" or Cheney. For those of you who say stop blaming it on Bush–it is a little hard to forget 8 years in only 40 days, let alone repair the damage. And for those of you crying about getting more information, you have access to more information (if you would look) than in the secretative Bush White House. Pres. Obama has always said he will listen to everyone who has an idea or solution. He is intelligent enough to know his short comings, when it comes from lack of knowledge on a particular subject, example military strategy (GATES), economy, etc.. He looks for the best and brightest in each field. This is a good sign of a GREAT LEADER. Bank stocks are brought and sold more than any other stock. Now that the banking industry is in trouble could that be why the STOCK MARKET is so low? Why are some people blaming Pres. Obama for the LOWS? What group of people trade most? My opinion is the wealth, now all they have to do to make our Pres. look bad is to not trade at all, just sell. I' m retired have had ATT stock for years. Not a high yield but constant. Stock price went down, dividend increase. Came out with NEW products other than phones, long distance,large communication systems. The message is companies have to change with the times, reinvent the wheel,be innovative, get rid of old THINKERS YOUNG PEOPLE WHO HAVE INSIGHT NOT SO FEARFUL. I'm older myself and I try to stay away from negative, unhappy people. We in this country are ALL BLESSED. At least we have food pantries, clothing ministries, churches that help. Oh yes we have WELFARE for those less fortunate AND THE LARGER % of those on WELFARE would rather have a decent paying job with benefits and HEALTHCARE. REMEMBER HE KNOWS WHEN TO SEEK AN EXPERT IN A PARTICULAR FIELD. HE IS SMART ENOUGH TO SURROUND HIMSELF WITH THE VERY BEST MINDS. WISDOM, KNOWLEDGE, STRENGTH COMES FROM A HIGHER POWER. Ever since the election in 2000 i was stress out not for my self but for the American people especially children until i made a song concerning the election that keeping me going first of all America is a blessed country there is a saying clean out your own back yard before you clean some one else own and think about the people right here in your home so lets keep it in GOD WE TRUST and GOD bless OBAMA AND GOD BLESS THE American people and thank GOD we have some one who love all people and the American people and some one who is smart to bring back the country together. This administration is got to stop comparing themselves to the predecessor. They are not any better. What are you going to say about your current boss? If the president was so analytical, then lets listen to both sides. We have gone down hill with Congress in the last 2 years. Lets stop blaming Bush and lets see what the president Obama can do with the leaders in Congress and the Senate. History will show but people have to stop making excuses and blaming one man. We do have a House of Congress and House of Senate, dont we? Lets get a little more productive and start looking at the details of the Stimulus package. Lets not hide from the American public. Lets not go into a camera and lie to the American people. Media, lets wake up and write stories that have integrity. People of Americans should better watch very well, i see serious attack coming against the US people. In essence – Obama doesn't know what he is doing and wants to get everyone to help him make a decision… even if it means calling all the past Presidents including Mr. Bush. it's not in doubt that people of Americans are not safe from terrorist based on the state of things. I will advise Mr. Obama to re-examine his strategies purported to use to end the two dangerous wars. He must use harsh manner, if he really wants to end the wars and protect the Americans. My candid advice to ALL Americans is not to rejoice yet until Mr. Obama is fully tested. the posters on here saying that obama seeks others' opinions/input because he is weak, inexperienced, or incapable have obviously never been leaders, are not leaders, or should never be leaders. leading is not about dictating. good leaders are inclusive. no one person know's everything – no one!! but a good leader know's how to inspire, motivate, and get the best out of others. i manage a department of 100+ employees – i know i can't do it all alone or make uninformed decisions. i have to check with my downline because they know the conditions on the ground better than i do. asked whether he know how to do everything in his company (Getty Gas), he replied, no, but stated that instead, he knew exactly how to find those who can do it well.